Michael Ferguson is responsible for working with our wealth advisors to develop comprehensive financial planning analysis that help our clients make sense of their finances and clarify their long-term financial goals. 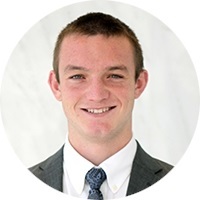 Michael graduated from Virginia Tech in 2016 with a bachelors degree in finance and successfully completed Virginia Techs accredited financial planning program. He spent two summers working for the Architect of the Capitol in their budget office where he assisted the Lead Budget Officer and CFO while performing historical analysis of the AOCs budget allocation. More recently, Michael interned with Washington Wealth Advisors where he learned more about the process and importance of financial planning. In his free time, Michael enjoys being outside and spending time with his friends and family.